There is a strong correlation between landforms, tectonics (the lithosphere) and climate (the hydrosphere and the atmosphere). This is one of the exciting recent developments in the study of mountain building processes. Through detailed studies of rain and snowfall patterns from weather stations and satellite records, scientists have created detailed records showing that precipitation is highest along the south-facing flanks of the mountains. 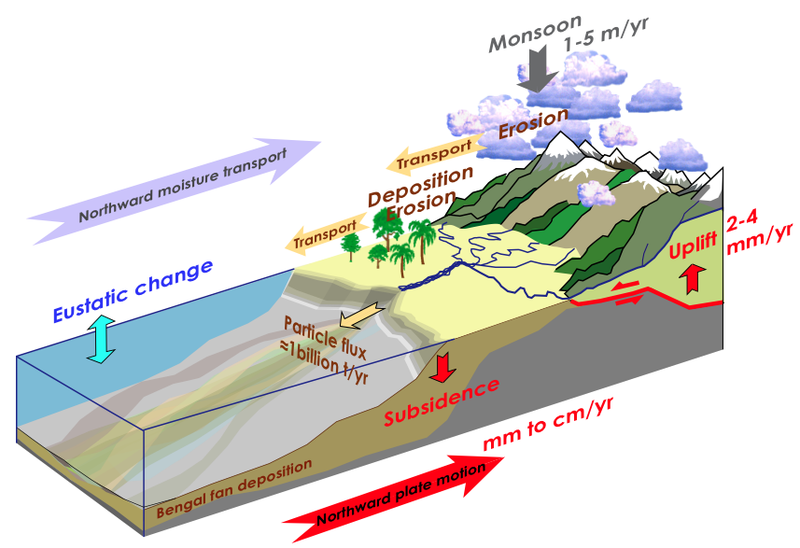 High precipitation rates translate directly to high erosion rates, and stream sediment load samples confirm that the south-facing flanks of the mountains are eroding more quickly than other parts of the Himalayas. Correlations between precipitation and erosion rates and rates of uplift (how fast the mountains are rising) show that mountain uplift is greatest where precipitation is greatest, i.e. that increased rates of erosion result in increased rates of uplift. Doable Demo: Float a wooden 2×4 in a tub of water and pile some sand on top. Mark the water level on the 2×4. With a watering can, create rainfall and erosion on the sand pile. As sand (the mountain) erodes off the 2×4 and slides into the water, the board rises up out of the water. Now here’s the cool part: The mountains themselves create the weather that produces high erosion rates on the southern mountain flanks. Mountains stick up into the atmosphere and deflect air flow patterns. When air masses rise to pass over mountains, they lose their ability to contain water vapor and excess moisture falls out as rain or snow. So, plate tectonics created the Himalayan Mountains when the Indian sub-continent crashed into Asia from the south. The mountains created the Monsoon patterns that are such an important part of Indian life, and which increase erosion rates on the southern flanks of the mountains. Increased erosion results in increased uplift, which enhances Monsoonal air flow! How’s that for a positive feedback loop?